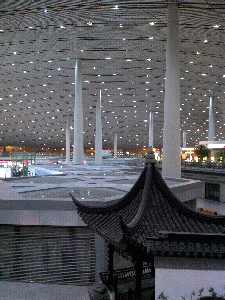 Beijing Capital International Airport never fails to impress me: the 60ft+ ceilings swoop in graceful lines between the towering support columns and I'm pretty sure it's the largest indoor space I've been in. The flight from Winnpeg to Vanvouver was a rough one - some of the most up-and-down, side-to-side turbulence we've ever encountered. We had a bit of a scare for our trans-pacific flight - we could not check in online and when we showed up the plane appeared fully booked and we were sitting apart in different sections of the plane. Fortunately we were plenty early for that flight and Julie managed to find an actual Air China employee to nicely rearrange our seats for us. 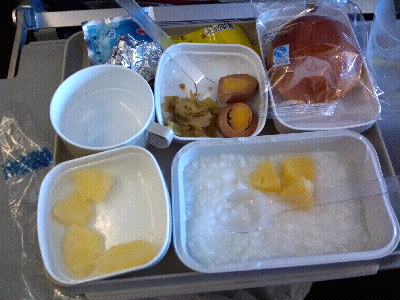 They fed us twice on the flight; breakfast at 3am Vancouver time and then lunch at 3am Beijing time, separated by two movies and about five hours of semi-valuable sleep. Sure am looking forward to Hong Kong and waffles, bubble tea and that spectacular skyline!